reception room all in one! Driving from Boston was difficult for meetings during the week but Chris was more flexible than I think anyone else would have been with us! I was NOT an organized bride at all and she was there to help me every single step of the way! She was in contact with all my vendors double checking the details. She knew what my themes were and what I imagined and inserted small details throughout the entire experience that made me feel like I was the ONLY bride in the world she was dealing with! It had a 70% chance of raining on my wedding day and all I wanted was to get married in the wedding garden and despite some quick sprinkles Chris made it happen! She promised she wouldn't make it be indoors until the very last second and the weather held out! I swear that she called upon the giant rainbow herself! Food was so important to our family and my guests have not stopped talking about how amazing ours was! The chef was incredible! I'm sure a lot of brides are told that their food was the best their guests have ever had, but I honestly have heard it so much! Guests drinks were never empty and the service from all of the employees was exemplary. I wouldn't change one detail about my experience at GreatHorse. Such a hidden gem! Thanks so much Chris, Lauren, and everyone else at The Starting Gate for helping make my wedding better than anything I could have imagined! Beautiful location and amazing staff! We met with the event manager who was super friendly, informative and bent over backwards for us. We had already booked a different venue and date but were so blown away by the facility and the event manager that we ended up booking with them. Dream location for your big day! Couldn’t have imagined a better place to celebrate our big day! Chris Sullivan listens to your wants and brings them to life! She is the best and so organized! Thank you to Chris and all the staff for making our celebration a dream come true! This venue is absolutely beautiful! Chris and her team make it so easy to plan your wedding. She was so helpful from the moment I walked in. The service provided was superb and the food is delicious! Everyone couldn't stop talking about it! Chris is the most organized person and will make anything happen! I would host any event at the Starting Gate. The Starting Gate was the very first venue tour I booked when planning my wedding and it was the ONLY venue tour I needed. We were blown away with the immaculately kept Great Horse grounds and the stunning views from the top of the country club. You can tell this venue strives to provide the utmost quality in everything they do. Chris and her team were incredible to work with. They helped answer and address any questions I had and went above and beyond to help me organize all last minute details. The food provided by The Starting Gate's own chef is AMAZING. The Starting Gate hosts a individual tasting and listens to any and all changes you'd like to have. Our guests are still talking about the amazing filet they had at our wedding! The bridal suite is beautiful and the perfect place to get ready, take pictures, and be pampered at the start of your day. We were treated to a fun breakfast spread and mimosas as soon as we arrived. Chris helped take care of every little detail for the remainder of the day from drink orders and hors d’oeuvres for the bridal party during pictures, to fixing my veil, to addressing any detail-oriented concerns I had. She was on top of it all so that we could enjoy our big day! The Starting Gate truly exudes luxury and makes any event feel very exclusive. I hope to attend more events at The Starting Gate so we can enjoy the amazing venue, service, and food again! My husband and I got married @ GreatHorse on 6/30/18 and we could not have had a better day. From the very first day we set foot into the venue we knew it was for us. My ENTIRE experience with Chris was amazing. She wrote back to every single email I sent to her quickly and always answered our questions. She was accommodating and patient with me during some of my indecisive moments and everything turned out to be even better than I imagined it would. The food is insanely delicious, the venue is stunning and the customer service is top notch. Not one staff member there misses a beat on anything. Our guests are still raving about our day and it was over 2 months ago! We wish we could have our wedding day over and over again, it was a blur but it was absolutely amazing. Thank you x's a million to Chris and ALL of the staff at GreatHorse for giving us the wedding of our dreams. You are truly amazing at what you do! From our first meeting with Chris and her team to the last dance The Starting Gate at GreatHorse exceeded all of our expectations. Not only is the venue stunning but the quality of the service is top notch. Chris and Lauren made the planning process fun, easy and we looked forward to every meeting we had with them. They did not miss any detail and even contacted all of our vendors the week of the wedding to confirm arrival times. We knew from the tasting that our guests were in for a treat with the quality and portion size of the food. The food on our wedding day was phenomenal along with the servers and bartenders who were polite and attentive to everyone’s needs. We still to this day continue to receive many compliments about the dinner and appetizers. I can’t recommend the Starting Gate enough, our wedding day was magical and perfect in every way. The venue is gorgeous, the bridal suite is beautiful and the view is spectacular even in the misty rain that we had. Chris and Lauren, thank you for your undivided attention and meticulous wedding planning. You made us feel like we were the only wedding that you were working on and we miss seeing you. If anyone is looking for a beautiful venue and want to work with people who truly love what they do, please check out The Starting Gate. I can promise you that you won’t be disappointed. Cannot say enough good things about this amazing venue. Chris Sullivan made everything so much easier for us, since we are living out-of-state - we couldn't have done it without her. She and her team made the wedding flawless. The food is excellent, we had a signature drink, and they accommodated our ideas for a s'mores bar and late-night breakfast food snacks. There just is no better venue in Western Mass in terms of scenery, professionalism, service, quality...their slogan is right on, it's different at Greathorse. I got married here this fall and can't say enough good things about it!!! The venue was beautiful and the staff was excellent. I worked primarily with Chris and she couldn't have been more accommodating. I would highly recommend this venue!!! My husband and I had our wedding reception at GreatHorse in October. Chris and her team were wonderful from our first tour to our last dance. The building is spectacular and our guests raved about the food. GreatHorse knew what our needs were going to be on that day before we did, and met them before we could articulate them. GreatHorse was truly a dream wedding. The Starting Gate at GreatHorse helped us have the most perfect wedding day. The venue itself is absolutely stunning, the bridal suite is to die for, but most importantly, the staff there is superb! Chris Sullivan made sure that the day of the wedding ran flawlessly and kept to the schedule. The food was incredible and all our guests were extremely impressed. We were also impressed by the food tasting which was completely private and we got to pick what we wanted to try in advance. The chef prepared everything for us right there and we had a personal server pouring the wine pairings. 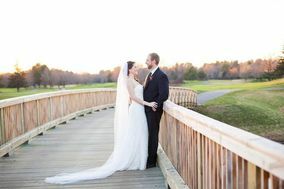 We could not have asked for a more perfect day! Since we first day saw the Starting Gate we feel in love with it. Working with Chris Sullivan was awesome, she helped make our special day a huge success! The staff was very professional, everyone complimented on the food, the service, and how great the view was. Thank you again for making our day extra special for us! The Starting Gate at GreatHorse in Hampden, Ma is an incredible wedding venue. From the moment you arrive at the majestic gates topped with gas flames you know that the GreatHorse team is going to transport you into another world. As you drive up the roadway you experience the beautiful maintained greens of the golf course and the stunning architecture of the buildings with breathtaking views of the Pioneer Valley. As the mother of the bride and someone who worked in the wedding industry for 20 years, I’m not easily wowed and all I can say is “WOW”! We were in awe of the beauty of The Starting Gate. The detail in the high copper ceilings, the gorgeous chandeliers, the beautiful stone fireplace, the spacious wrap around deck overlooking the views and the sides that can go up an down to accommodate the weather without taking away from the view (even the rest rooms are stunning)! We were sold, but that was only the beginning. Throughout the planning stages the Catering Manager, Chris Sullivan and her team (Meghan, Lauren and Cathy) guided us effortlessly. They were friendly, efficient and organized. Their knowledge and suggestions all made for the perfect day. We had the pleasure of getting ready in the most elegant bridal suite and the staff saw to our every need. I was pleasantly surprised to see the whole management team on the day of the wedding, executing the details flawlessly! Chef, Chris Cote’s culinary expertise and special touches did not go unnoticed. The fresh foods made onsite, the plate presentation, and flavor was truly five star and had all of our guests raving. Thank you to the whole team for making our daughter and son-in-law’s wedding a spectacular event! Everything about The Starting Gate at GreatHorse experience is exceptional. The whole process was streamlined and simple. The service can't be topped; the view is phenomenal; the food is outstanding. Chris made the reception seamless and took so much pressure off myself and my family on the day of the wedding. I was thoroughly impressed and so were all of my guests. I'm beyond thankful for the beautiful day they helped me create. Words can't express how special my wedding was. Chris is absolutely phenomenal. Loved working with her. The staff and their attention to detail is impeccable. Best day ever! We cannot say enough about this venue. Cathy and all of the staff was so wonderful throughout the whole process. We have gotten so many compliments from our guests saying it was the best wedding they have ever been to. Thank you for the perfect wedding day! Everything was perfect. Very professional. Easy to work with. The staff at The Starting Gate at Great Horse was very knowledgeable. My husband and I were fortunate enough to be the very first wedding at The Starting Gate at GreatHorse and will be forever grateful for the entire experience. The venue itself if top quality in every way possible...the view, the amenities, the staff; I could go on and on. The event coordinator was very organized, professional, accommodating...just a pleasure to work with! The food...is amazing! The Chef creates food that is sure to excite anyone's palate. I would highly recommend the Starting Gate at GreatHorse to everyone! It's easy to see why my husband and I fell in love with this venue... The Starting Gate is absolutely stunning. However, we knew we couldn't get married anywhere else once we met Chris Sullivan, the manager of catering. Chris, Meghan, and Lauren did an outstanding job helping us with every single detail-- I can't say enough good things about those 3! Just when we thought it couldn't get any better, we met Chef Chris. Not only did the food taste phenomenal, he takes great pride in the presentation of every single dish! The entire night, Chris and the girls kept everything running smoothly and my guests didn't stop complimenting me on the service of the wait staff. When you set your wedding or event date at The Starting Gate at GreatHorse, you are in the BEST of hands. It's pricy, but you can't beat the views, the food, the service, the private bridal suite with two bathrooms, the grounds and being the only wedding of the day. Cathy, Chris, Lauren & staff were amazing and we don't regret a single penny!